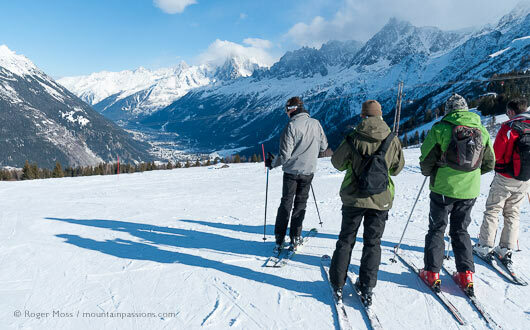 Gateway to the Chamonix valley, Les Houches has 55km of groomed terrain for all levels of skier. 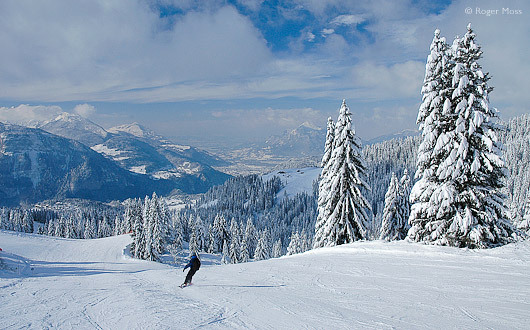 The varied terrain includes some long, tree-lined descents to the village and above Saint Gervais. It’s readily accessible via flights into Lyon, Geneva and Chambery or by road via Geneva, with a non-autoroute option from Lyon via Chambéry Savoie Mont Blanc and Albertville. Varied terrain in a compact ski area. Solid choice for mixed-ability groups. Possible to base yourself here if you want to ski Chamonix Valley. The skiing above Les Houches has something of a split personality. Hardened experts often dismiss the local terrain as being too tame, yet there are some long (and quite steep) runs here, including the world-famous black-graded ‘Verte’. What Les Houches doesn’t have, though, are the kind of nasty surprises (and conservative piste grading) which can catch out less-confident skiers further up the valley in less-than-ideal conditions. Close to the buzz of Chamonix but small and relaxed. Recent expansion in accommodation with luxury and budget choices available. After the lively buzz of Chamonix, Les Houches feels pretty calm and relaxed. It’s visibly on the up, however, so is clearly just what plenty of people are looking for, since remaining building plots seem to be snapped up by chalet-builders as soon as they become available. In the heart of the village you’ll find a helpful Tourist Office, Mairie, etc., plus a mini-market which these days is no longer quite so mini. It stocks most of what you’ll require for self-catering stays. Not that you'll be quite self-sufficient here; if you decide to dine out then chances are you’ll still end up heading up to Chamonix, where the choice is impressive, if predictably pricey. A welcome, but slightly less obvious feature of a stay here (particularly if you come in summer) is easy access to a choice of walks. You can begin with a relaxing perimeter stroll around the Lac des Chavants and work your way up to something more demanding in the form of a hike through near-silent forest on the benign-sounding Allée des Diligences, which will bring you to the rail halt at Vaudagne. Talking of which, if you’re staying locally, your accommodation supplier should provide you with a Carte d’Hôte giving free, unlimited travel on train and shuttle-bus services in the Chamonix valley. This brings areas as distant as Argentière and Vallorcine within reach of anyone based in Les Houches (and vice versa, of course). Why go skiing in Les Houches ? Novices should feel comfortable here, while intermediates can explore a surprising variety of long, varied runs down through the forest to the village. Advanced skiers will also enjoy the challenge of ‘La Verte’, a relentless, black-graded descent made world famous by the annual Kandahar World Cup Downhill Skiing events. There’s also a snow park. One unexpected retro feature is the Mont Blanc Tramway, which climbs from St Gervais to Belleview, at almost 1800m altitude. 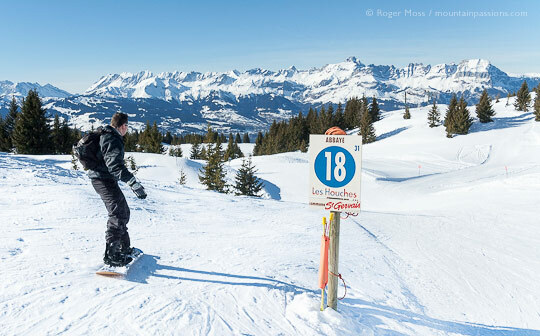 Les Houches is a solid choice for those looking for relaxing skiing amid glorious mountain scenery or non-downhill activities like Nordic skiing, walking or snow-shoeing. Wide slopes great for beginners. Free cross-country at Les Chavants, pedestrian ticket only required for high-altitude trails. 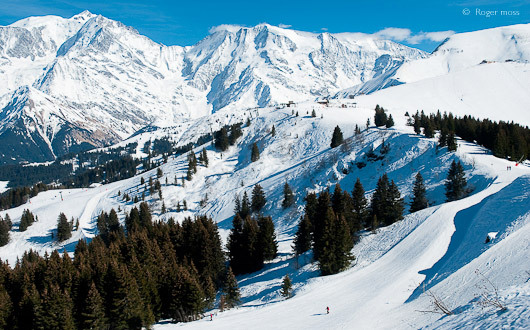 Les Houches is a popular destination for Handiski, with its wide slopes and relatively quiet pistes. One of the first schools to teach Handiski, ESF Les Houches offers lessons for any age and disability, in partnership with the Loisir Assis Evasion association. Free local bus and rail services for accommodation card-holders. Not linked by lifts to other ski areas. Difficult drag-lift serves some terrain. 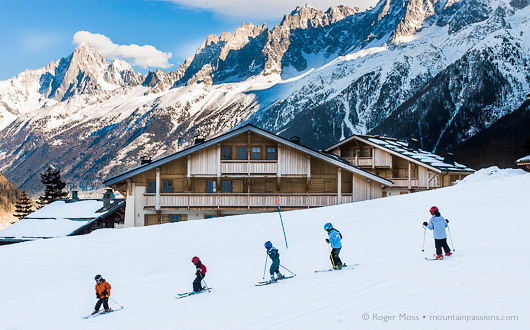 While you're here, spend a few days with a Mont Blanc Unlimited lift pass to ski elsewhere in the Chamonix Valley, using the free train and bus travel. Frequent buses during the day from next to the Prarion lift are useful to access the main village of Les Houches for food shopping, post office, Tourism Office and a range of restaurants and bars. Your Carte d' Hôte (travel card issued by to guests on arrival) entitles you to free travel on efficient bus and train services between Servoz (just below Les Houches) and Vallorcine (beyond Chamonix and Argentière). 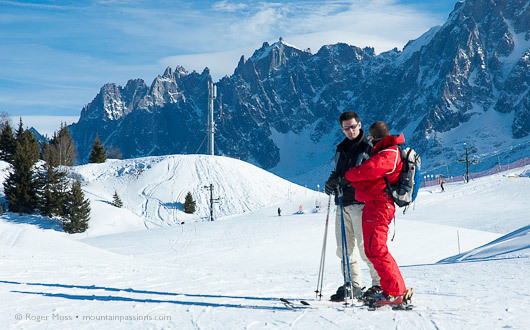 Winter tarif 57€ return - or included on the Mont-Blanc Unlimited Pass. Ride the world's greatest cable-car for a sensational two-stage haul at 10m/sec (12.5m/sec for the 2nd stage) all the way up to 3842m. When you get there you'll step into a different world, and gain a healthy respect for the people who work on the high mountain. In winter or summer you'll be gazing in awe at the snow-covered summit of nearbyMont Blanc. There's also apanoramic bar/restaurant, souvenir shop and a display of archive photographs celebrating the lift. It's also the departure point for the epicVallée Blancheglacier descent. This classic rack railway begins beside the Gare SNCF de Chamonix and winds its way up to the celebratedMer de Glace, where you can view the glacier and walk down to anice-caveunder the surface. These days getting down onto it requires a gondola lift descent, followed by 430 steps of a series of steel stairways fixed to the rocks. It's an adventure, after which you can browse for souvenirs or revive your energy levels with drinks and snacks or a restaurant meal while awaiting the return train. Ride this historic tramway (France's highest mountain railway) from Le Fayet or Saint Gervais up to the Col de Voza, and higher still to the 1794m Bellevue in the heart of theLes Houchesski area. Choose a clear day (check the webcams) to enjoy fabulous views. Mountain restaurant beside tree-lined pistes in the Saint Gervais sector, with panoramic views from the terrace. No-nonsense menu with salads, soup, and a selection of hot meals. Situated under the Maison Neuve chairlift, this cosy piste-side café/restaurant has a south-facing terrace, popular for a late-afternoon pause on your final descent. A40 Autoroute : Exit at Saint Gervais-Le Fayet and follow the expressway towards Chamonix-Mont-Blanc until the turn-off for Les Houches. The nearest airport is Geneva, (70kms). Regular shuttle service available. Jet2.comoffers low cost flights to the French Alps from 7 UK airports. TGV Paris (Gare de Lyon) - Saint-Gervais-Les-Bains Le Fayet with connection to Les Houches and other stations throughout the valley via the Mont-Blanc Express. Staying in the Valley entitles you to a Guest Card enabling you to travel FREE by bus or train in the Chamonix Mont-Blanc valley, from Servoz, Les Houches, Chamonix, Argentière to Vallorcine. Arriving at Les Houches has a certain drama, particularly when (as has happened to us on more than one occasion) you enter the Tunnel des Chavants at the end of the viaduct up from Cluses in steady drizzle and emerge in the Chamonix Valley amid a vigorous snowfall. It’s at times like these that you appreciate being able to peel off at the first exit and head round into the village. Twinkling cheerfully in the darkness, it looks welcoming enough, but temperatures here have plummeted. During our first visit getting to our relatively high, piste-side accommodation meant fitting snow chains, but this time we’ll staying at the much more easily accessible Hameau de Pierre Blanche, one of our favourite CGH Résidences. With the car securely garaged underground, we transfer our skis to the heated locker room and our baggage via a lift direct to the floor on which our apartment is located and set about unwinding and getting a good night’s sleep. Next morning it’s a simple matter of putting on our boots, liberating our skis and walking to the nearby gondola lift to head up the mountain for some serious skiing. Days like this are what Les Houches is all about, with the prospect of a perfect ending on the long return routes back to the village, via a choice of blue, red or black runs, with much of the Chamonix Valley spread before you. 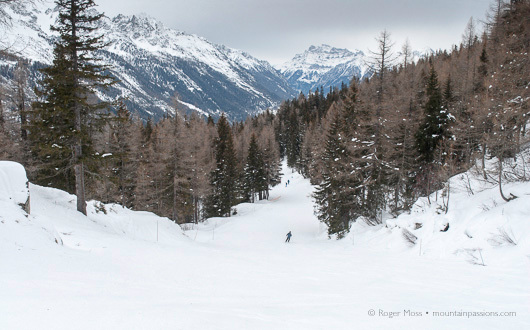 There are enjoyable, quiet tree-lined runs in the St Gervais sector. There's plenty of time to appreciate splendid Alpine scenery from the lift. The Prarion gondola hauls us smoothly up to the heart of the terrain, where a wealth of possibilities is spread around us. Snow quality is perfect, so we glide off to take a closer view of the distant Belleview plateau. It’s blue-graded cruising terrain all the way, which allows time to take in the scenery – something we find ourselves doing more and more during our time here. Along the way we cross the ‘Verte’ piste just a few days before the legendary black run is due to host the Men’s World Cup Downhill skiing events. For now, though, we focus on Les Houches’ gentler side and press onward down towards Belleview. When we halt above the snow-park we’re beside the tracks of the Mont Blanc Tramway, which since 1907 has climbed up here from Saint Gervais via the Col de Voza. Despite the passage of time, its still creates something of a surreal sight as it rattles and whines its way beside the pistes. Skiing alongside the trams is a unique sensation and can usually be relied upon to raise a few smiles from passengers, many of whom are probably getting their very first glimpse of a ski resort. From up here you can peel off the trackside piste and onto the red-graded Mur des Epines or Variante runs, which soon unite for the drop down to Maison Neuve (1220m). From there you have the option to join the lower section of the celebrated Kandahar Black or ride the Maison Neuve and Kandahar chairlifts up to Prarion to do the whole run or its blue-graded companion Aillouds. Either way there’s 900m of vertical drop on offer, and you’ll end up right back in the village beside the gondola lift. Plan B, which we’ve come to favour during the earlier part of the day, is to head from Prarion to the sector above Saint-Gervais. 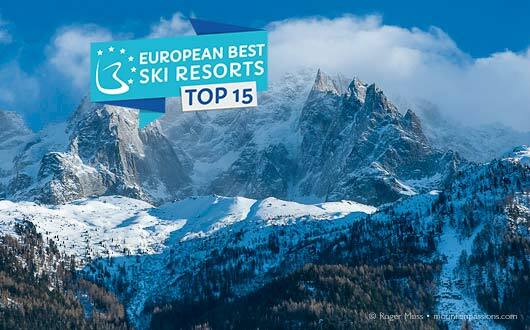 We’ve found that things are often quieter over here, and there’s a choice of very enjoyable tree-lined runs which will drop you either at the Crozat four-seater chairlift (1493m) or lower still to the base of the long, 40 year-old Plancerts draglift (1370m). The away-from-it-all sensation of skiing these scenic runs is addictive, and might just be the perfect excuse to stay put, rather than heading further up the valley, where things tend to be rather less calm. With a Mont-Blanc Unlimited Ski Pass, Les Houches is well-placed to make the most of the access to the Evasion resorts of Saint Gervais and Megève (new from 2015/16), Courmayeur in Italy (via the Mont Blanc tunnel), or any of the Chamonix Valley resorts. You could even ski in Verbier in Switzerland. There are excellent free transport links throughout the Valley, (Carte d’Hôte required, ask your accommodation provider). Les Houches is a good place to learn to ski, whatever your age. Tailored instruction by an ESF monitor. From Belleview we drop down to pick up the Voza lift, which drops us at 1900m. A quick blast down the red-graded ‘Stade’ piste followed by a ride up the Kandahar chair gets our legs warmed up for the onward run over to the terrain located above St Gervais and nearby Les Contamines. Half-way down, at the parting of the ‘Cha’ red and ‘Abbaye’ blue-graded pistes we reach a piste-side restaurant, where we take a lunch break in the sunshine. 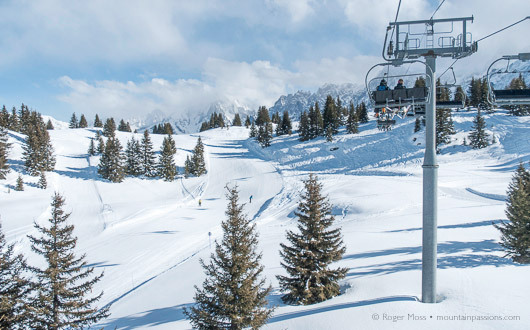 We leave suitably refuelled and legs of lead, to continue our run down through the trees to the base of the Crozat chairlift, which hauls us serenely back up to do it all over again, this time on the steeper, red-graded ‘Fontaines’. The steep descent is huge fun, and there’s even more nearby for good skiers who don’t mind a long, steep haul back up the long Plancerts drag-lift. Days like this are what Les Houches is all about, with the prospect of a perfect ending on the long return routes back to the village, via a choice of blue, red or black runs, with much of the Chamonix Valley spread at your feet.